In April 2013 Google announced Google+ comments for the Blogger platform, since then WordPress users were waiting to get this feature on their WordPress websites. I have heard that there are few plugins available which can enable Google+ comments in WordPress. From last couple of days, I have been testing out few plugins, which promises to add the Google plus Comment feature to WordPress without any issues and with less or no coding . I found two great WordPress plugins, which works out of the box and have got positive responses from users. More comments on your blog. Can build up good community on Google plus for your blog. Increase in fan following on Google +. Comments doesn’t held up in queue for moderation so you have to monitor the comments on daily basis to filter out non-relevant comments (you know what I mean here :)). if you are running a large blog with hundreds or thousands of posts then the number of comments you may get on daily basis could be more and monitor them every day could be a tedious task for you. Before we discuss about plugins, let’s see how Google+ comments will look on your blog. Step 2: Activate the plugin. Update the plugin settings if required and save settings. That’s all, The plugin should be working by now on your WordPress blog. » You can place below code in your theme’s template to manually positioned the comment section. » Use the below code when you want the comments to be appeared for the specific page/post. Just use the code while writing post/page. That’s all you should know about this plugin to get it worked for your blog. Step 1: Download the plugin from here: Comments evolved WordPress plugin and activate it. Step 2: Find the configuration settings at Comments » G+ comments. 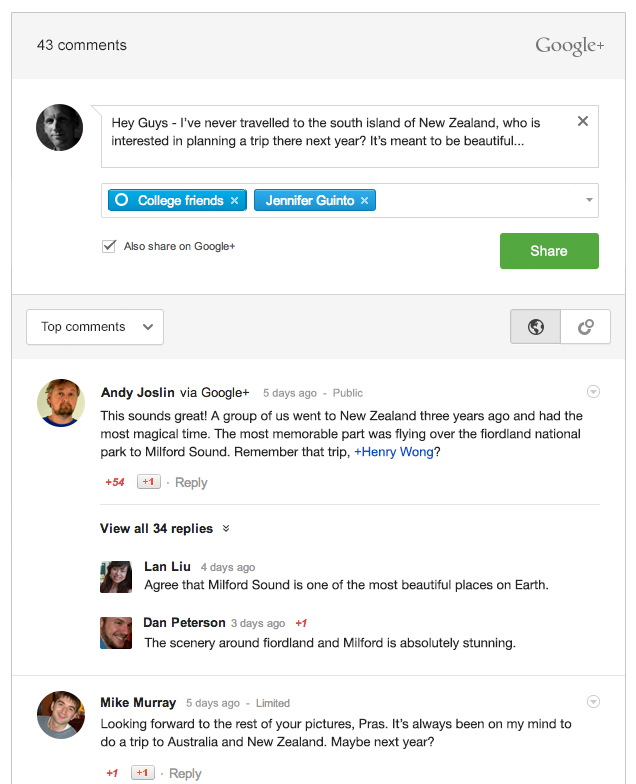 Adding Google+ comments to the WordPress site can be good in terms of traffic and visibility. As Google plus is popular social networking sites now a days, the number of comments on your blog is surely gonna increase. I have heard positive feedback from other bloggers too regarding them. If you have a good fan following on Gplus then there is no excuse of not trying this feature. Let us know if you face any issues while setting up the Google+ comments in WordPress.